Part Used & Method for Pharmaceutical Preparations: When tangerines are still green in June or July, the green skins are removed, cleaned and dried in the sun. 1. Stagnation of qi in the liver manifested as distension and pain in the breast and hypochondriac regions. 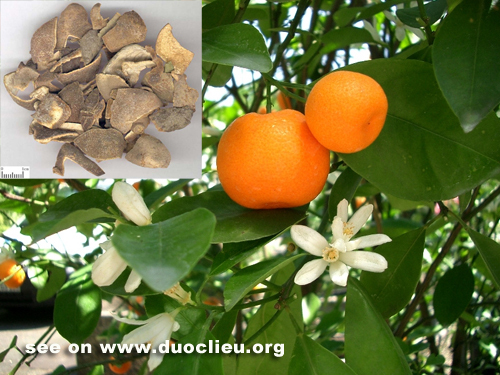 Green tangerine peel (Qingpi) is used with Bupleurum root (Chaihu), Curcuma root (Yujin), Cyperus tuber (Xiangfu) and Green tangerine leaf (Qingjuye). 2. Mastitis. Green tangerine peel (Qingpi) is used with Trichosanthes fruit (Gualou), Dandelion herb (Pugongying), Honeysuckle flower (Jinyinhua) and Forsythia fruit (Lianqiao). 3. Cold stagnated in the liver meridian manifested as painful swelling of testicles or scrotum, or hernia. Green tangerine peel (Qingpi) is used with Lindera root (Wuyao), Fennel fruit (Xiaohuixiang) and Costus root (Muxiang) in the formula Tiantai Wuyao San. 4. Retention of food manifested as fullness, distension and pain in the epigastric region. Green tangerine peel (Qingpi) is used with Hawthorn fruit (Shanzha), Germinated barley (Maiya) and Medicated leaven (Shenqu) in the formula Qingpi Wan.